If you are planning to buy a used car in Tennessee, do some background checks. There are several ways to obtain information about a vehicle. You can lookup the history by license plate number or by VIN. Either way, you should verify previous owner information, recall and accident data. Make sure you check the status of the vehicle if it was rebuilt or damaged in a flood. 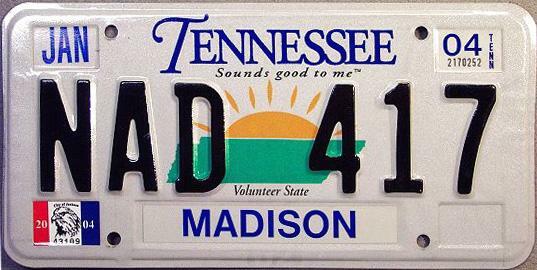 To get a Tennessee license plate, vehicle owners must title and register the car in this state. After completing registration, you will receive one (1) license plate. The registration plate shall be attached on the rear of the vehicle. County clerks across the state register vehicles and assist with these transactions. Review the information on this page before visiting your county clerk. This is to make sure that you bring the correct documentation and meet all legal requirements. How do you get a title for a car in Tennessee? A lien release from the seller. Copy of current registration if transferring your license plate. Emissions test certificate (if applicable. Payment for the title transfer fee and sales taxes (varies by county). How to transfer car title of a deceased person in Tennessee? Probated will or a letter from the executor showing you inherited the vehicle. Affidavit of Inheritance (if there is no will) completed by all heirs. Properly signed certificate of title. If the license plate is lost, mutilated or becomes illegible, you may apply for a replacement. You can submit your application at a county clerk’s office. Pay a fee of ten dollars ($10.00) for each application. Does Tennessee have front license plates? Tennessee is part of the “Rugged Nineteen” states that require only a rear tag. In the other 31 states, the law requires that vehicles display front and back license plates. How do I get a personalized license plate in Tennessee? Personalized plates are available for automobiles and motorcycles. Submit Application for Tennessee Personalized License Plate to the Vehicle Services Division (44 Vantage Way, Suite 160, Nashville, TN 37243-8050). Pay $35 personalization fee for regular plate or $70 personalization fee for specialty plate. How much does it cost to transfer tags in Tennessee? Tennessee license plates can be transferred from one vehicle to another. Transfer fees include Title transfer fee: $1 and License plate fee: $21.50 (standard plate). Buying a used car in Tennessee? Don’t risk buying a vehicle with hidden problems. Learn about the car’s ownership history and any major damage. Check for accidents. Look at the car’s service records. Know the damage caused to the vehicle and if it has undergone repairs. Check that the car is in good working condition. Make sure the vehicle is not salvage or flood-damaged. Verify that the car’s odometer is accurate and has not been tampered with. Look for liens and stolen cars. Find out if the vehicle is reported as stolen and not recovered. Check all documents match. Make sure the license plate matches the registration and insurance records. Run a Free Tennessee License Plate Lookup to avoid used car fraud. Get a vehicle history check!